WORLD’S QUICKEST STREET EV IN 2016? The Enfield 8000 Flux Capacitor rolled into 2016 having reached a 10 second quarter mile as a street car that’s totally useable for average journeys. 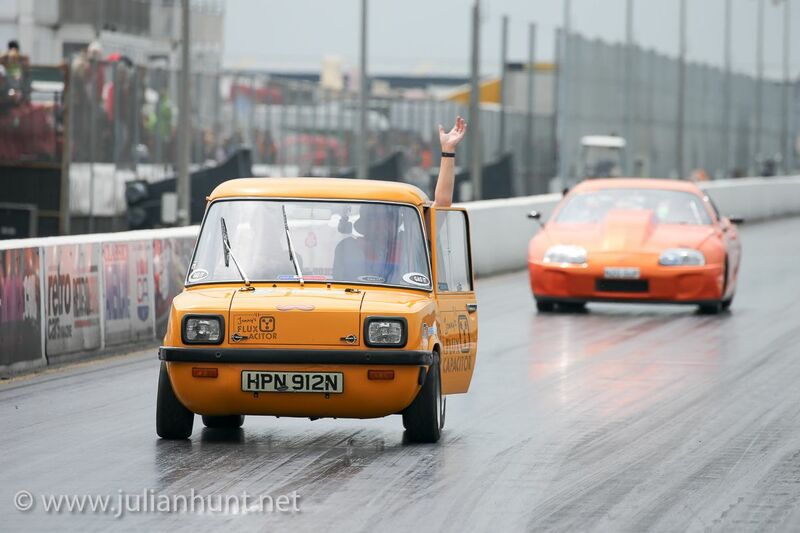 From taking my daughter to school in it to completing the mandatory 26-mile street cruise around Northamptonshire to qualify for the Street Eliminator drag race category (where if you break down, you’re out of the event), the Enfield has exceeded all expectation. I’m not going to fib, it feels amazing to have set out to build a mid 12 second Tesla Roadster-beater and finished 2015 scoring a smooth, straight 10.84 second quarter mile at 121mph. 0-102mph in 6.9 secs. Not bad for a ‘70s city car originally designed to do 45mph. Here’s the vid if you haven’t already seen it. Yes, I lose the race against the Nissan GT-R but that car runs 2500bhp for crying in a bucket! But there was a problem. The first question everyone bombarded me with after clinching Europe’s quickest street legal EV was ‘When are you going for the world record?’ They had a point. How quick could the Flux Capacitor be before it felt unsafe and plain silly? The journey thus far with the Enfield project had been so fascinating for me and, seemingly, quite a few other people. Even the doubters – those who only believed in pistons and petrol – were coming around to the notion of a silent-but-violent eco hot rod. I’d like to say it was all my PR, but I suspect the introduction of Elon’s Tesla Model S P85D and its YouTube muscle car munching vids also helped. Whatever, the Enfield is shed-built and going faster. 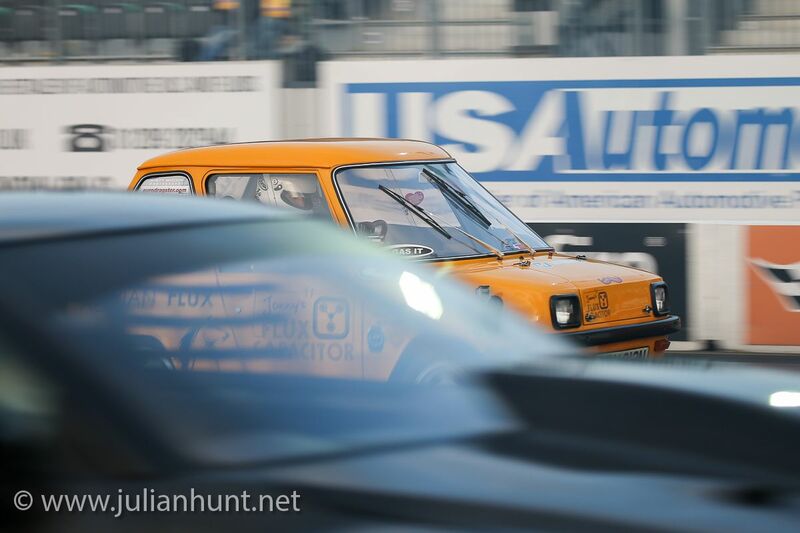 There is no way I would be in a position to refine and evolve the little car without continued enthusiasm and support from Adrian Flux Insurance, Hyperdrive Innovation and my old mate/crew chief Nick Farrow from Gas It. 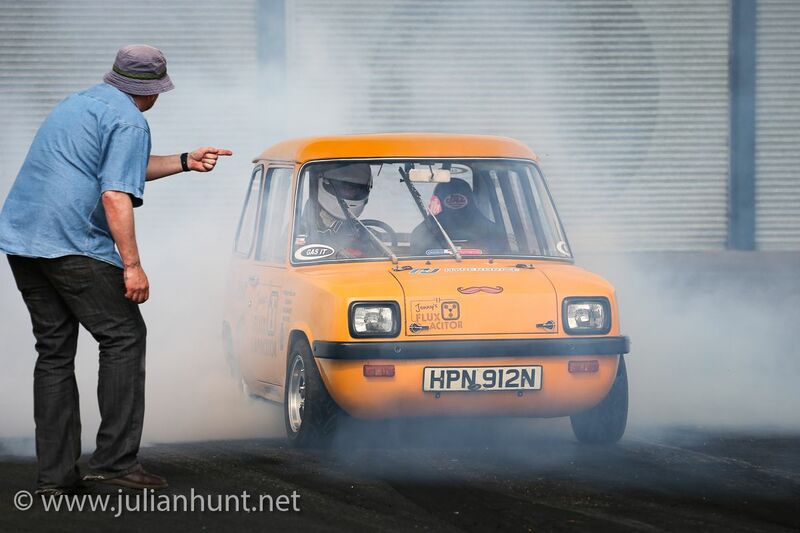 He’s the bloke in the crap hat pointing at me whilst I warm the rubber in the burnout box.